There are a number of trends that are very hot at the moment and craft-work is very popular. There are many different ways in which you can put your craft skills to good use but the use of textiles in creating souvenirs and keepsakes is definitely on the up. If the happy couple has a love of craft activities and they are looking to create a wedding invitation that will look as good many years from now as it does today, this is going to be a stunning option. 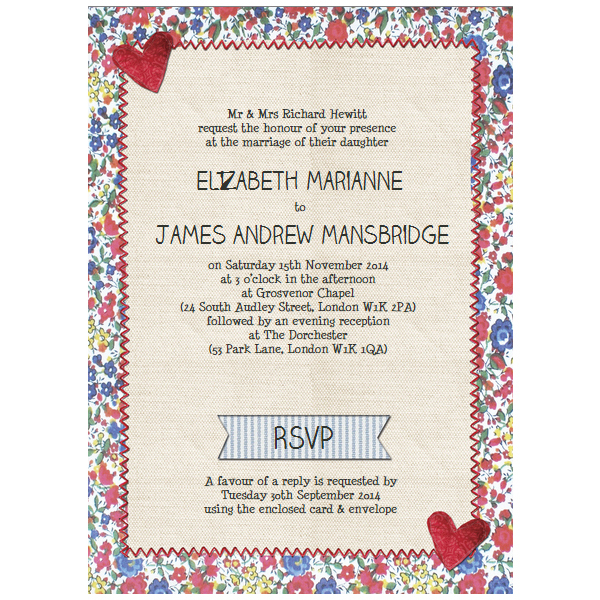 There is a country fete theme with this invitation that offers a very rustic fabric style and feel. With the look of stitching patterns and floral details, this is a simple design that will tug at the heartstrings of people of all ages. The key focus of the card falls on the love heart and the colour scheme of pink, red, yellow and blue will ensure that everyone loves what is on offer. You will find that the card is customisable and double-sided, so there will be plenty of opportunities to include all of the details that matters for the special event. If you are looking to have a traditional or modern down-at-home style wedding, this unique invitation by Hip Hip Hooray will set the tone perfectly for your happy occasion. There is also a range of associated stationery with this product so if you are looking to send out a lot of information or follow up notes, you can do so in the same cheerful and colourful style. There is a lot to be said for sending out invitations and notes in a way that matches your mood and expectations, and this is a tremendous wedding invitation that is perfect for people who feel as though they are quite handy in life.